Cranberries are a group of evergreen dwarf shrubs or trailing vines in the subgenus Oxycoccus of the genus Vaccinium. In Britain, cranberry may refer to the native species Vaccinium oxycoccos, while in North America, cranberry may refer to Vaccinium macrocarpon Vaccinium oxycoccos is cultivated in central and northern Europe, while Vaccinium macrocarpon throughout the northern United States, Canada, and Chile. 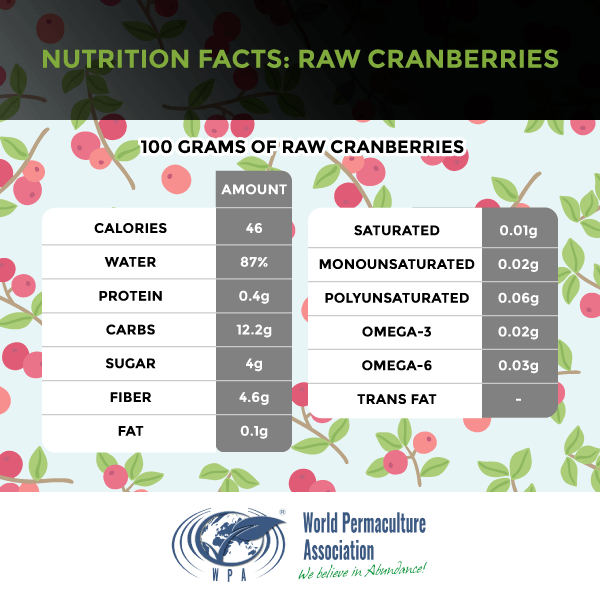 Cranberries are high in Vitamin A, C, and K. Cranberries also contain proanthocyanidins (PACs), an antioxidant that may help prevent a range of diseases. One teaspoon of sugar per ounce, cranberry juice cocktail is more highly sweetened than even soda drinks. When you purchase dried cranberries or cranberry juice you want to look at the ingredients and the amount of added sugar. Additionally, make sure you’re buying cranberries from farms that do not use pesticides. 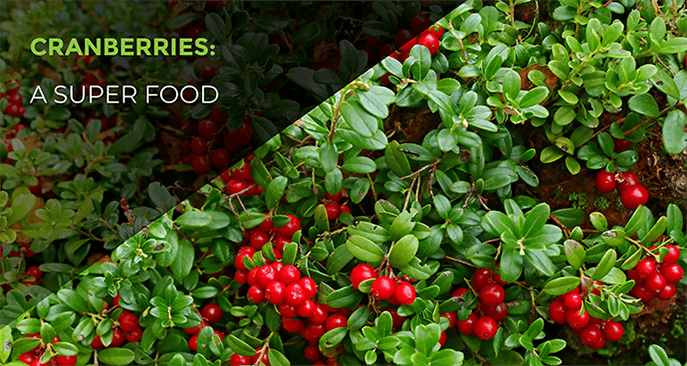 The history of cranberries has been considered a superfood used for four hundred years before the first cranberry protein bar. According to Mihesuah, who also runs the American Indian Health and Diet Project, the Native Americans ate cranberries as fresh fruit, dried the fruit and formed them into cakes to store, and made tea out of the leaves. The Inuktitut of eastern Canada used the cranberry leaves as a tobacco substitute. There was also a range of nonculinary uses for the berry, says Mihesuah. Cree boiled the fruit and used it to dye porcupine quills for clothing and jewelry. Chippewa used cranberries as bait to trap the snowshoe hare (3). The first Big Chemical Pesticide scare in the food industry was the chemicals on cranberries in November of 1959. Arthur Fleming the Secretary of Health, Education, and Welfare of the United States (the agency that preceded Health and Human Services), announced that domestic cranberries were contaminated with a weed-killer called aminotriazole. Eventually leading to a ban on this chemical pesticide because of it being a carcinogen. Almost sixty years later we are still fighting the battle of chemical pesticides on our food and consequences on our health, the health of the soil, and the Earth. 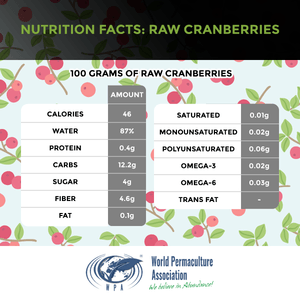 Cranberries were an abundant native staple for hundreds of years, Nowadays roughly 200 to 300 acres in the United States (4)—are grown organically out of all the cranberries on the market. The rest of every fresh cranberry, cranberry sauce, and cranberry juice have thirteen pesticides. Out of those thirteen pesticides, three known or probable carcinogens, six are hormone disruptors, five are neurotoxins, one has developmental or reproductive toxins, and six have profound environmental effects with pollinators including honey bees (2). The solution is always within Permaculture! Consequently, there is a place to expand and go back to growing cranberries without the use of chemicals. Comment below if you grow the cranberry plant using vertical, aquaponics or in pots by using biodynamic farming. I would love to hear more about your success! One of the struggles of growing the cranberry plant is the requirement of acidic soil needing a pH balance between 4.0 and 5.5. A great companion of cranberries is blueberries because of the acidic soil. As Always, Remember to get off of the Chemical Treadmill and, Produce more than you consume! 1. Calvan Bobby Caina. Cranberry industry seeks to avoid school ban. Boston Globe, 25 June 2012.